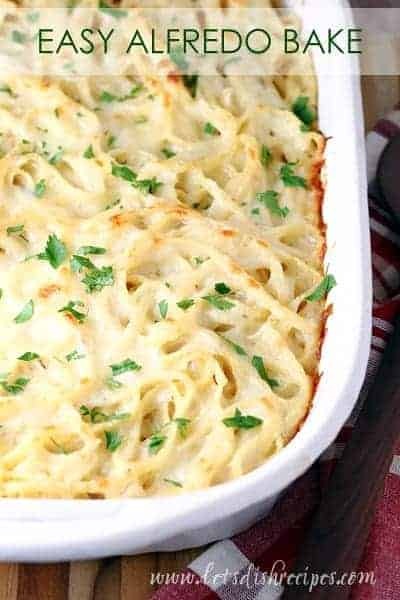 EASY ALFREDO BAKE — Classic Alfredo sauce is combined with linguine and baked to perfection in the crowd-pleasing recipe! 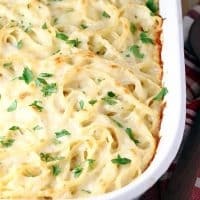 If you’re looking for a simple, easy dish that the whole family will love, look no further than this Easy Alfredo Bake. It’s ready in just over 30 minutes, and everyone at the table will be going back for seconds! My 12 year-old gets all the credit for this recipe. Once a month or so I give my boys the chance to plan and help prepare dinner. 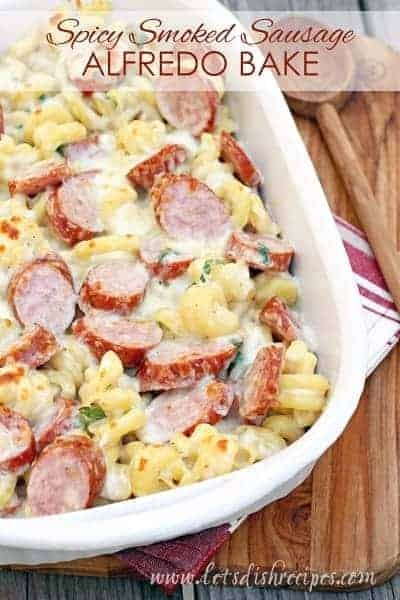 This simple pasta bake was his choice for the main dish. The original recipe he found on Pinterest included chicken, but he wanted to go with straight pasta, so that’s what we did. Of course, you can probably imagine how the possibilities are endless for adding things like chicken, shrimp and vegetables to this dish. 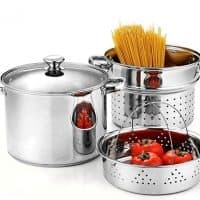 Or using different kinds of pasta. We really love this recipe with linguine, but spaghetti and fettuccine are great too. Honestly, I can’t think of a pasta that wouldn’t pair well with Alfredo sauce. I love that even with a homemade Alfredo sauce, this was such an easy meal to get on the table, and despite it’s plain and simple appearance, it was SO good! I think it was the herbs de Provence, which I plan to add to all my Alfredo sauces from now on. Because this dish is baked briefly at a very high temperature, you get lots of wonderful browning on the top. The crispy edges are my favorite part! Just add a green salad or some steamed veggies and you’ve got a complete dinner that the will please even the pickiest of eaters. 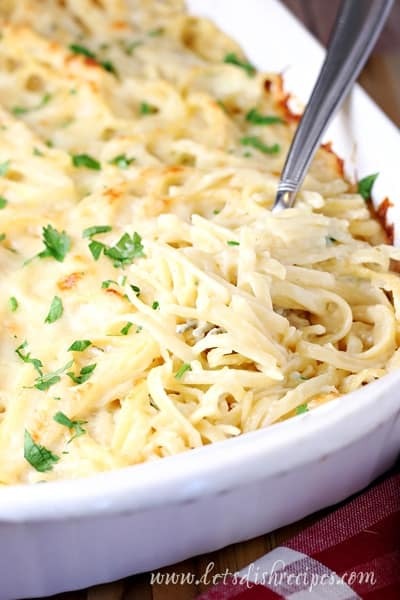 Be sure to save this Easy Alfredo Bake recipe to your favorite Pinterest board for later. 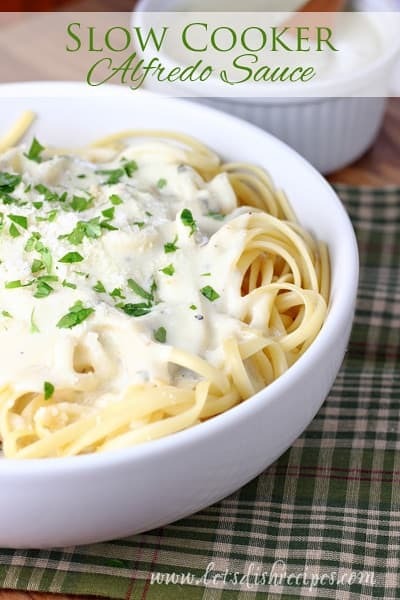 Classic Alfredo sauce is combined with linguine and baked to perfection in the crowd-pleasing recipe! Preheat the oven to 450 degrees. 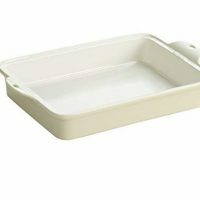 Lightly grease a large baking dish. Cook the linguine according to package directions. Drain and set aside. Meanwhile, in a large saute pan, melt the butter. Add the garlic and cook until fragrant, 1-2 minutes. 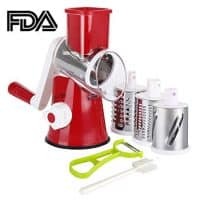 Whisk in the flour until smooth. Gradually whisk in the chicken broth and milk, stirring until smooth. Cook and stir for about 5 minutes, or until sauce has thickened. Reduce heat and add half of the mozzarella and Parmesan cheeses. Season with herbs de Provence, nutmeg, salt and pepper, to taste. Combine the sauce with the cooked linguine and toss to coat well. 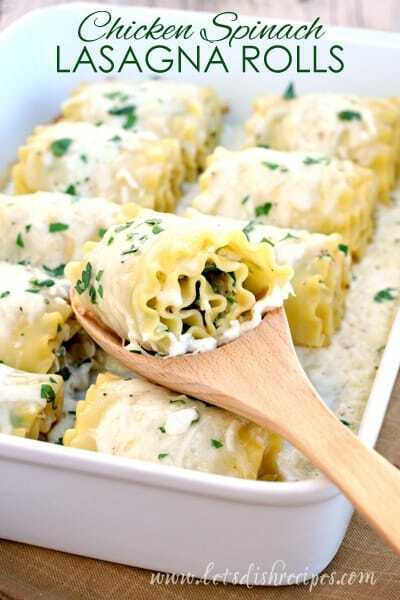 Transfer the pasta to the prepared baking dish. Sprinkle with the remaining cheeses. Bake for 15-20 minutes or until bubbly and golden brown. 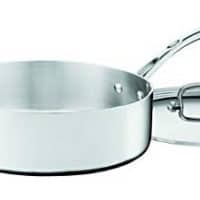 Let stand 5-10 minutes before serving. Sprinkle with fresh parsley for garnish.